The ascension of Chikka Devaraja Wodeyar, also known as Devaraja Wodeyar II, to the throne of Mysore, marked a turning point in the history of South India. On one hand, the kingdoms of Vijayanagara and Bijapur were losing hold over their territory and on the other Mysore was independent and asserting itself as Vijayanagara’s political heir. Thus, his ascension to the throne was marked by the inevitable conflict between feudalism and imperialism. Chikka Devaraja was the eldest son of Dodda Deva Raja, the elder brother of Devaraja Wodeyar I. He was born on 22 September 1645. He spent his initial childhood years under his father’s guidance until the latter renounced the state in 1659. He was trained and educated in the principles of drama, linguistics, poetry, rhetoric, politics, religion, music, gymnastics, swordsmanship and archery. He was an excellent horse and elephant rider. 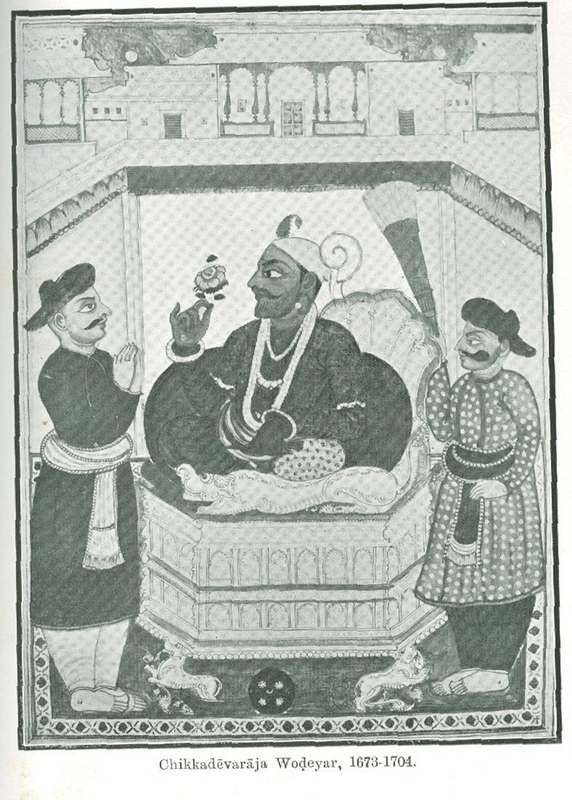 During the reign of his uncle, Devaraja Wodeyar I, he lived in Seringapatam as the crown prince. He displayed a military spirit and rare courage as the crown prince. In 1668, he was sent away from Seringapatam to the village of Hangala to continue his education and training. At the age of 28 years, Chikka Devaraja was installed as the 14th Maharaja of Mysore. His installation occurred 16 days after the death of his predecessor, Devaraja Wodeyar I. His first act as Maharaja was to create an executive council or cabinet of ministers to help him govern the kingdom. Merely five days after becoming the Maharaja, Chikka Devaraja began a campaign to expand Mysore’s borders. 1675 is a landmark year for Mysore’s political evolution. By this time Chikka Devaraja has secured Mysore’s borders and Vijayanagara had lost most of its power, Hence, Chikka Devaraja was in a position to claim the throne of the Karnataka Empire. The Kingdom of Mysore continued to grow under his rule through conquests and negotiations. In July 1687, Bangalore was formally acquired by the Kingdom of Mysore. By the end of his reign in 1704, the Kingdom of Mysore extended from Bangalore in the north to Coimbatore and Salem Baramahal in the south and Chikmagalur and Sakrepatna in the east to Hassan and Kadur in the west. This led even Aurangzeb to acknowledge Chikka Devaraja as the Emperor of the South. He was gifted a signet ring seal with the title “Jug Deo Raj” and a sword with a gold etched hilt from Aurangzeb’s personal regalia. Chikka Devaraja was an able administrator and his court had a number of scholars. Hos council of ministers was a powerful advisory body but the roles of his ministers were not clearly defined and he was regarded as the fountainhead of all authority and power. While the king was at war, it was this council of ministers that administered the Kingdom. Mysore’s defense was one of Chikka Devaraja’s prime areas of focus. Along with the number of men in his army, the weapon system also grew and evolved. The maintenance of law and order was also given special importance. The kingdom’s tax system was revised and according to some records, revenue of 2 bags of 1000 varahas each was deposited in the state treasury each day. Another important development during the reign of Chikka Devaraja was the standardization of weights and measures. Iron was an important industry. Weavers, dyers, tailors, plasterers, artisans and basket makers were also patronized. Forts acquired in the expansion of Mysore were renovated and marketplaces were planned within them. Chikkadevaraja Wodeyar’s rule was important for the evolution of Vaishnavism as the professed faith of Mysore’s ruling dynasty. Melkote and Seringapatam were two of the important strongholds for Vaishnavism. Other religions like Jainism also flourished in the Kingdom. One of the king’s earliest acts of piety was to build a temple dedicated to Lord Paravasudeva on the banks of the Kaundini for the attainment of salvation by his father’s soul. He also built a temple in Seringapatam, Haradanahalli and Varakoclu. Many other temples were renovated during his reign. In 1700, Chikkadevaraja launched an irrigation scheme by damming the Kaveri River and excavating canals on either side of the river. The scheme did not work as planned when heavy monsoon showers broke the dam. During the initial years of Chikkadevaraja Wodeyar’s rule, dependant Wadeyars and Poligars who had commenced working towards being called Rajas were compelled to renounce any claim of independence. A number of unusually high taxes were also introduced in these areas. This leads to riots and strikes. Since the strikers were backed by Lingayat priests, the king invited all priests to the Nunjendgode temple on the pretext of a discussion. 400 priests arrived at the temple. After paying their obeisance to the king, they were directed through a narrow corridor where they expected to find refreshments. Instead, as each priest walked through the corridor, he was executed and the body was tumbled into a pit dug for that reason. On the same day, a number of other Jangama must were also destroyed. This was followed by orders given to troops to kill orange-robed men in any mob gathering. The orange robe was the characteristic dress of Jangama priests. This continued until written renunciations were exacted out of every village.